This blog is NOFOLLOW Free! There’s been quite a bit of discussion about small generators in several Usenet newsgroups of recent. These two little generators have been the focus of most of the the discussion. At the top we have the Universal ChiCom 1000 watt 2-stroke generator, here represented the one sold by Northern tools who supplied the photo. 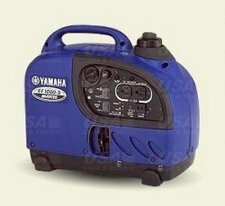 This generator is currently on sale for $99.95. The Yamaha EF-1000iS with an MSRP of $689.00. The street price is considerably lower, though I don’t have any handy to quote. All three of these units are rated at 1000 watts nominal output. That’s about all they have in common. The Honda has formed almost a cult following whose members act like scientologists – literally exploding at the mere mention of any fault or any other negative opinion. They show about as much rationality as scientologists. I get asked the question quite often, “which small generator would you buy?” My answer is 1) not Honda because they price fix by prohibiting the advertising of prices on the internet. Dealers will not even provide prices via email. Otherwise, my answer is “It depends“. The Yamaha is a superb little blue blob and equal to or surpasses the Honda. The ChiCom special is also a fine little unit, especially when the $100 price is figured in. The two units, however, are as different as night and day. If your main application is casual – let’s say, a tailgate party at a football game where you run the big screen TV in the back of your pickup truck and maybe a drink blender then the Yamaha is the one for you – if you can afford it. At light load it is almost silent and barely sips gas. Because the ChiCom special is not an inverter generator, the engine has to run at a constant 3600 RPM regardless of load. It is very significantly noisier than the Yamaha at light load. Now let’s suppose you have a big load, say, an electric chain saw or lawnmower or you’re in an emergency situation and need some heat during a blackout. Most often than not, those loads will momentarily exceed the 1000 watt rating and will cause the inverter to toss up its hands, light the red “fault” light and turn off. The generator engine must be stopped and re-started to clear the fault. The bottom line is that the load will not be operated, even though it might draw less than 1000 watts once started. Or let’s consider the situation where you have a load that will overload the generator. Let’s say a 1400 watt heater. The Yamaha (and Honda) will not even attempt to run this load. The $100 ChiCom special will. Read on. Last night about midnight it was 14 degrees outside and rising. I had to go outside for something and noticed the ChiCom special that I carry in the trunk of my car. Questions has arisen about the cold starting ability of the ChiCom special. I decided that a test at 14 degrees with a couple of days of cold soak when it was even colder would be a good test. 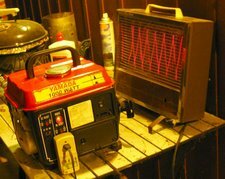 I hauled the generator up on the front porch of my cabin and sat it on a table. I needed a load for the generator and the first load that came to hand was a 1400 watt heater. Hmm, two tests in one. Cold starting and overload ability. I turned on the gas (I always let the generator run out of gas before storage), allowed a few seconds for the float bowl to fill, held the choke fully on (it doesn’t get there in the “choke” position” and pulled. It takes awhile to coat all the internal surfaces of a 2-stroke engine with gasoline before a flammable mix can reach the combustion chamber so I was not surprised that it took 8 pulls. On that 8th pull, however, it fired right off and ran fine. I let it warm a bit and then plugged in the heater through a Kill-A-Watt power meter. Here is a photo of the setup. You’ll notice that this generator is red. That’s because I bought it in the 2001 time frame from a ChiCom tool vendor at the Daytona Turkey Rod Run’s flea market. This was long before Northern Tool picked up the generator and had it painted their blue company color. the front panel trim is also slightly different. The generator itself, as verified by tear-downs, is the same as the Northern one. I paid $129 for that generator back then. This photo was taken using only the light of two porch lights. Impressive. The same holds true for my chainsaw and my electric lawnmower. Though I haven’t done any detailed measurements, I can hear the engine lug down when either are started, and with the chainsaw, I can hear it lug down when I really feed the wood to the saw. BUT! Both run and run well. During this test I ran the generator about an hour. After maybe 15 minutes the circuit breaker tripped. I let it cool a minute (simple thermal type), reset it and the generator ran the heater for another 15 minutes. I repeated this procedure for the rest of the hour. The important thing is, the generator housing remained barely warm to the touch! I didn’t have my infrared pyrometer handy so I couldn’t shoot the windings but they were obviously not overheating. Granted, the generator was running in 14 deg air but I know from experience that even in summer heat, the generator head does not overheat. 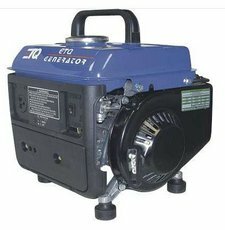 This generator is engine limited. I’ll probably bypass the circuit breaker or install a larger one, since the engine is simply incapable of overheating the windings. Someone is bound to ask “What happens if the output is shorted?” Answer: “nothing”. Literally. The field de-excites, the output drops to zero and the engine returns to idling at 3600 RPM. When the short is removed, the generator re-excites within a second or two and the output returns to normal. This little ChiCom rig really is the “Generator that could”. It takes just about any abuse that I toss at it and just keeps on ticking. Not bad for the cost of a nice meal at a fine restaurant. Note that Northern normally runs its price back up to $149 after Christmas. It doesn’t take too much googling to find the generator offered for $99 year round. One final note, some companies fraudulently advertise this generator as a 1200 watt unit. No way, no how, no time! It can surge that much or more momentarily, as in starting a motor but it just barely meets its legitimate 1000 watt spec. Good enough for me. Good article John. I saw your mention of the Cannon A590IS. I recently purchased the same model, after much investigation, to replace a Nikon that got smashed. I’m glad that I choose the Cannon. It is a great little camera. My wife especially likes the optical view finder. My only complaint is the recycle time to charge the flash. I’ll live with that! John, thanks for posting this as well as the info you posted on RORT. I purchased one of these bad boys and will test it out in the Keys this winter when we Dry Camp at the Navy Base there for a few weeks. Like you I think the $100 price makes it a deal as long as it produces 1,000 watts. My unit (TG1200) came in a box with “Portable Generator 1200 Watts” written on every side. Don: I’m so embarrassed! Not an excuse but an explanation, “nosier” is also in FireFox’s dictionary. I’ve been a spelling nazi (though I’d never do it in public like a certain other person used to.) ever since I let an issue of my magazine slip out with a misspelled word on the cover! Talking about red faced! Al: On the Canon, I had that problem when I first got mine. I was using the same NiMH batteries that I’d always used. I read somewhere that the low-self-discharge batteries have more surge current capability. I bought a set of Ray-O-Vac Hybrids and Viola! Problem solved. Battery life also went from a couple dozen pictures to several hundred. One other tip. If you momentarily half-press the shutter release button about a second after taking the photo, that fools the camera into thinking it’s in motor-drive mode and will immediately become ready for another shot. If you don’t press the button then it take about 10 seconds to store the picture, during which the camera is otherwise dead. With the flash on, how long it takes come come back depends on battery charge. With a new charge, about 4 seconds, will an almost completely dead set (indicator flashing), about 10. This little camera is kinda like the little generator – I can’t believe how much value Canon crammed into a $169 (Circuit City store purchase) package. Mike: Don’t you just love liars, er, Marketers? It’ll do a kilowatt all day but 1200? Nah. Al: Forgot to say. I also highly recommend the accessory flash that Canon offers, the HF-DC1. It’s wireless so no connection to the camera needed. It has three brightness levels, the brightest of which is a monster. Only thing I don’t like is that it uses those darn CR123 lithium batteries. Fortunately I have a number of rechargeable ones (LIR123) from my flashlight addiction :-) and the flash likes them just fine. I have one of these chicom gensets I bought a year or so ago at Kragen Auto Parts for $99. It’s half the size and weight of a comparable 4 stroke unit. I will second everything John says about it! It was John who gave me the idea of using it with my electric chain saw. The only issue I had with this application is I once had the cable draped over the muffler and melted the insulation. John, I cranked my new generator for the first time yesterday. Flipped the choke to *full choke* and it started on the 3rd pull. I thought it would take more pulls than that to get fuel since it was the first time fuel had been in it. When I plugged my motorhome in to it I notice that my circuit tester says the Neutral & hot wires are crossed. Do you think I sould disassemble and switch the connections on the output plug? In a word, NO. The generator output is completely isolated from earth ground. In this context, there is no concept of hot or neutral – only two power leads floating above ground. Stray capacitance is probably fooling your tester. Your question has spurred a whole ‘nuther article to be posted shortly but in a nutshell, my Megger showed isolation better than 1000 megohms at 500 volts, output to ground. If you like (wait for the photos if you wish), you may designate one wire, say the one hooked to the wider blade on the outlet, as neutral and jumper it to ground. That will make your tester happy. It also increases the risk of shock from touching something live. With the system floating, one connection (through your body, for example) between either conductor and ground does nothing. A second connection would somehow have to be established before shocking current could flow. am also interested in your adsense web site. I would like to take the content from my current web site and turn it into an adsense web site. Sign up as a publisher. You will be assigned a publisher number and then given a choice of what kind of ad you want to run. Horizontal, vertical, pure text or graphics, etc. You are then presented with a little hunk of code that you paste into your web page(s) wherever you want the ads to appear. You can see the code in my pages by selecting “view source” and looking at the HTML code. I have the google code clearly delineated. Don’t copy my code, though, unless you want me to get paid for clicks on your site. The way the money works is, every time someone clicks on an ad, Google applies a sooper-secret algorithm that depends on your PageRank and how much was bid on the AdWords by the advertisers (AdWords – key words, if you will – are auctioned in real time to advertisers. The advertiser that has bid the most gets the spot when your page loads.) and the end result is, you earn a few pennies. It varies but with my current PageRank (low), I think that each click is worth about 4 cents on average to me. When you’ve earned $100 or more, Google pays you, either via check or EFT to your designated checking account. I have done absolutely NO so-called SEO or Search Engine Optimization. My PageRank is what it is. There are people who claim to have figured out Google’s algorithm and for a price will modify your site to optimize your PageRank. I know that I could do several things such as becoming a link pimp (begging other sites to link to me – an important ingredient in PageRank) but I’d rather just post useful stuff and grow slowly. Unfortunately the current algorithm rewards people who post little content of value but who do it every day. Those type typically post something that is actually interesting about as often as I do, providing the incentive for people to link in. The result is a very low signal to noise ratio but lots of revenue. My approach is to post good stuff and enjoy whatever it earns. As a web user, I generously click on ads at good sites to reward the webmaster for his hard work. When I have the opportunity, I also nick advertisers that I loathe. For example, I click on every sleazebay ad I see! With their PageRank and the amount they have to bid to get on practically every search result, each click costs them a bunch. So let’s see – you refer to the Chinese as “ChiCom” throughout – combining both an obnoxious namedropping of wannabe pseudo-military lingo and nasty overtones of perceived superiority thrown in. You then go and buy one of their products, thus providing cold hard cash to these hated “ChiCom” infidels and proving that not only are you an obnoxious holier-than-thou turd, but also an utter hypocrite. after replacing the fuel mixture and it will not come on it is in the shop now they told me it has a weak spark and the coil needs replacing I hope northern tool has the part available. Please drop back in and let us know how the repair went. Lots of interest in that regard. Here’s a little 4 stroke Honda replica that uses an inverter. Works great Model XG-SF1000 and well priced! John, I am spending a few weeks in a dry camping area in Key West (the Navy Base) and have been exercising my little generator every day. The vast majority of my neighbors have hondas or yamahas which are nice machines (very nice). However, they all gather around to see my little 1-kw generator. It is so small and cute and they flip out when they realize I only paid $100 for it. VBG I think 90% of the men in the park have been by to check out this genny and this is a BIG campground (I am on site 631)so that gives you an idea. It is also remarkable quiet. The noise is on the order of my neighbors 2kw honda. 1. It starts on 3rd to 5th pull. 2. It will run for 9-plus hours on a gallons of gas while producing between 4 to 7 amps. Damn, that is sweet. I love it. 3. It runs better under load than without at least a 3-amp load. I say that because it is noisier at no load — it sort of knocks without a load but smooths out under a good load. 4. My neighbor with the 2kw honda has a 6-gallon boat gas tank connected to his honda with a 1/4″ gasoline hose. The set up is totally neat in that it connects to the honda via a “special gas cap” with a fitting on top that would normablly be where air is vented to the gas tank. 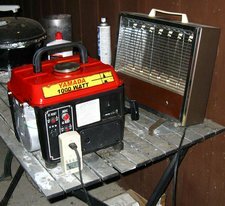 In this set-up as the generator draws gas out of the generators built in gas tank a vaccuum is ceated in the built in gas tank and that vaccuum pulls gasoline through the gas line from the external 6-gallon gas tank. This fellow installed two inline shut off valves in the gas line between his external gas tank and the honda gas tank. One valve is on each end of the gas line. Using this set up the fellow has a full generator gas tank when his 6-gallon external tank becomes empty. Thus he just switches off both valves and disconnects the external tank and fills it. Talk about sweet. This is an awesome setup. My neighbor spends 3-months here every winter so he is set up for this life. As creative and handy as you are you might consider “rigging” an external gas tank. That sure would make long stays virtually trouble free. If you do please share your “rig” with us. I would be interested. Re: remote fuel tanks. You read my mind. I’m just about to post a review of some commercial products and then describe my setup. Stay tuned. Couple of things to check. I suspect either an air leak in the intake or a plugged idle jet. Check to see if the bolts that hold the carburetor on are nice and snug. If they are, remove the carb (very easy 5 minute job), remove the float bowl and look for debris in the bowl. Blow out the jets with compressed air, particularly the idle circuit. This generator is set up to run very lean to comply with EPA emission specs. Therefore the least little obstruction of the fuel circuits will cause lean surge, what I think you’re experiencing. Have some light portable work to go. Bought one of these PortStarPlus 1200W units just to see how it will work. I am wondering about Break in, and any modification of the oil mix ration. Go a little heavy or lite. I don’t do anything as far as break-in goes. Modern CNC machines are so accurate that break-in tends to not have much meaning. The recommended oil mix is 50:1. I run my just a bit leaner to reduce the smoke output. So far no negative consequences, even when severely overloaded. re: spark arrestor. Probably doesn’t have one. I’ve never looked. Easy enough to make one – just a cone of screen wire that fits in the exhaust opening. Of course it won’t have the USDA’s blessing. I’m assuming that these little gensets can’t be paralleled for larger AC loads like the inverter blob gensets can, but for a DC (battery charger) load, what if I run it through rectifiers before paralleling the output? Ah-ha, now I found it. Of course, you’ve already answered most of the question elsewhere..
What about just using rectifiers and then paralelling the DC output, if I’m going into a Manzanita Micro battery charger? I had owner one watt 800 they great engine and great everthing had 3 light 75 watt and tv flat 38 inch and dvd box and AC 3 Way-Power Cable-1 male plug-3 female plugs. Lucas semi synthetic 2-cycle oil and gas 93 octane and plug spark E3 It was a great about had 43 hour right now. Thanks for the post John. This was interesting yet informative. The post had some important things to consider when deciding what type of generator to invest in. Pomodoro by Headsetoptions + MandarinMusing | Hacked by neonjohn | Sponsored by Giganews + DreamHost Inc.